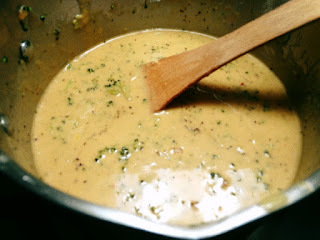 Pam's Midwest Kitchen Korner: Healthified Broccoli Cheddar Soup on a Cold Winter Day! 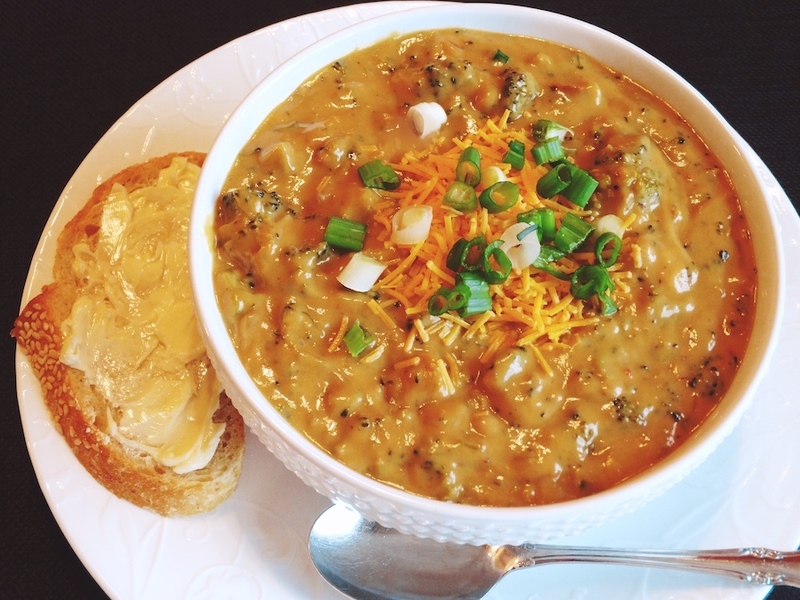 Healthified Broccoli Cheddar Soup on a Cold Winter Day! 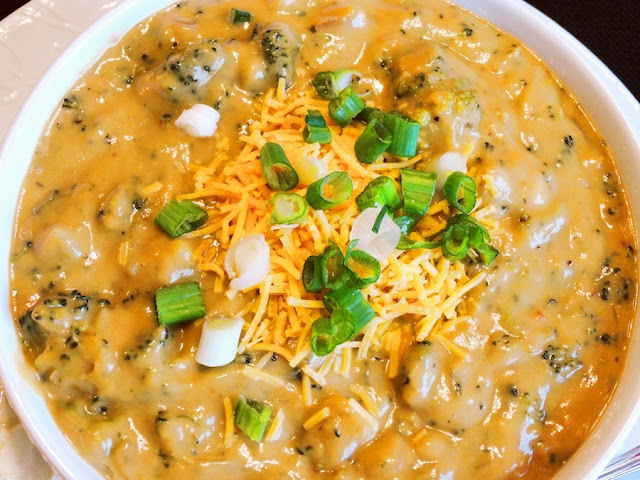 Sometimes, on a chilly day, you just need a bowl of hot, creamy, cheesy soup for a comforting meal, just not all the calories and fat though. 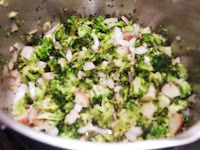 I found a plethora of recipes on the internet for broccoli soup and settled on this healthier version of it, a recipe courtesy of Food Network Kitchen. Bill and I really liked this soup ~ it's truly delicious for lunch or a light supper! Besides the delicious bunch of fresh broccoli, the recipe substitutes the usual cream or whole milk with fat-free evaporated milk ~ one would be hard-pressed to notice the difference. Low-sodium vegetable broth cuts down on the salt intake, while giving the soup a rich golden color. Freshly grated nutmeg adds a spicy touch. I used the extra-sharp cheddar cheese; maybe next time, I will try reduced-fat sharp cheddar. This is plenty of soup for 2 or 3 people, and the recipe is easy enough to double for more. The recipe states, leftover soup should be reheated in the microwave rather than the stovetop, where the cheese will “break” or separate from the broth. Believe me, you won’t miss the excess calories and fat, nor will your waistline! The soup is so delicious ~ I will be making it again soon! 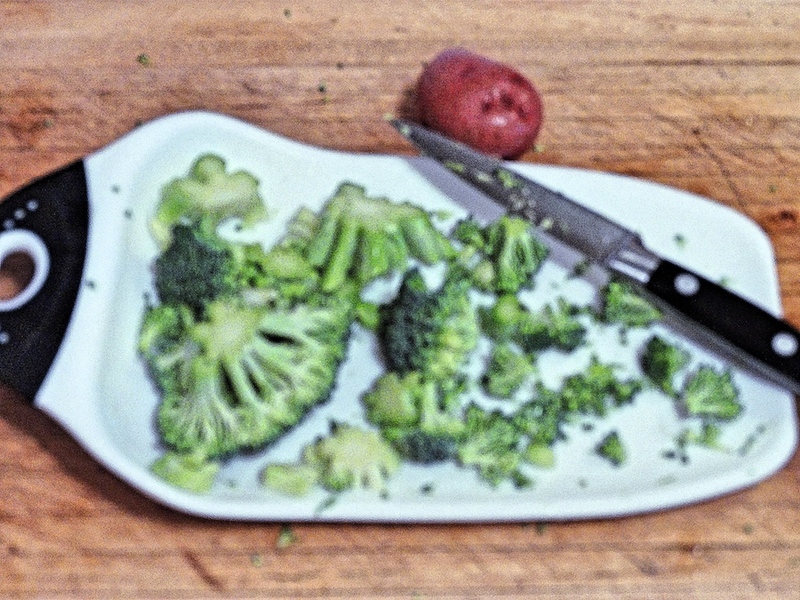 Separate stems and florets from the broccoli. Trim and discard the bottom of the broccoli stems. Finely chop the stems — coarsely chop the florets and set aside separately. Mist a large pot with nonstick cooking spray and heat over medium heat. 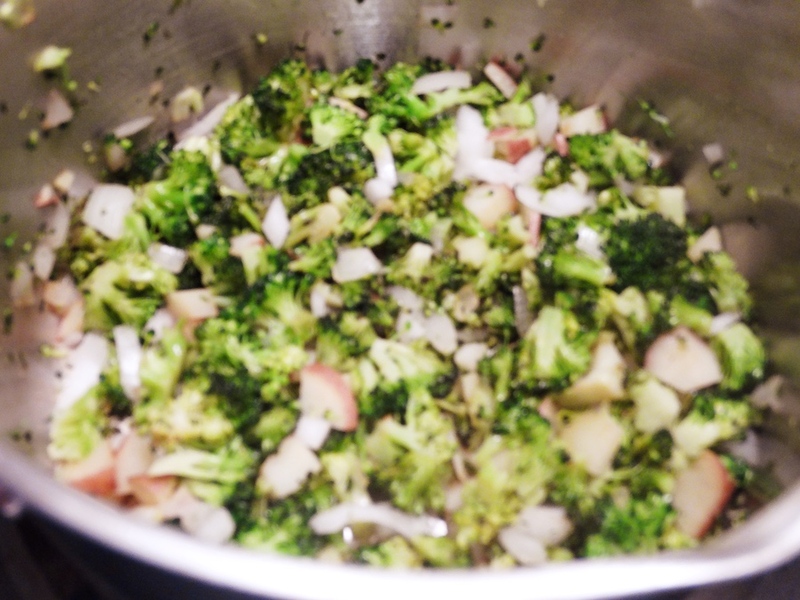 Add broccoli stems, onions and potatoes and cook, stirring, until softened 7 to 10 minutes. Add flour and cook, stirring, until lightly toasted, about 2 minutes. Reduce heat to maintain a simmer and continue to cook, stirring occasionally, until thickened and the vegetables are tender, 12 to 15 minutes. Meanwhile, combine the reserved florets and ½ cup water in a small saucepan. Bring to a boil, cover and continue to steam until they are bright green and crisp-tender, about 5 minutes. Add the entire contents of the pot with the florets to the soup along with the nutmeg. Stir in the cheddar, Worcestershire and milk. Garnish with scallions and cheese, if desired. Note: Leftover soup should be reheated in the microwave rather than the stovetop, where the cheese will “break” or separate from the broth. Interesting, Diane! I get that, sell local products. The soup is good! And you have a good week! I'd like the crushed red peppers for heat, Bill wouldn't be so crazy about it. Hope you give this soup a try, it's very good! Have a good week, Dave! So delicious and comforting! I haven't had some in a long while and can't wait to make a huge pot soon. Hi Angie! I'm glad you like it. Have a great week! Sounds like a good hearty soup for a cold day. Unfortunately it won't be long before it is cold here again. Oh, yum! How very comforting that would be! We expect a very rainy week ahead here! This would be perfect! Thanks, Nellie! We're still in the snow mode here and very chilly this morning, 4°! Have a good day! Soup,broccoli, and cheddar cheese - we love all three of them, and not only on a winter day. The first and last photo displaying the ready soup look awsome! Good photography adds so much to a recipe! And I believe anyone that can cook a meal can also take a good picture of it. Yum! Looks and sounds delicious. Now I am craving it. Great, hope you do, natalia! Thanks! I think the whole USA is in soup-eating mode this week! I often make broccoli or cauliflower soup with a process similar to the one you used — but I deny having a recipe. So far this week it’s been chicken soup and chili. Hi Mae! Good with the broccoli soup. I need to make soup more often and broccoli soup will be on the list. Thanks! One of my all-time favorite soups!! This looks delicious, especially for a cold winter day. It is, Amy! Thanks for the visit! I'm making this tomorrow!!! Snow day! This looks terrific! And yes, I can use recipes with just a bit less fat -- but that are still flavorful. Terrific dish -- thanks. What a delicious soup Pam...and I bet that it will warm not only your body but your soul too...love the low sodium broth...healthy and tasty! You're tight, Juliana! It warms the soul too. It's more healthy and good! Thanks! This looks like awesome soup! And it seems a perfectly reasonable way to get Manservant to eat broccoli! Hi Abbe! Yes, this might be OK with Manservant. It makes broccoli taste really good. Have a wonderful day! Pam, there's nothing like a nice bowl of soup on a winter day. I like the use of the fat-free evaporated milk and nutmeg, it makes good sense. Broccoli is abundant at the market these days and cheese is always in the cooler, so I see a weekend lunch coming. Thanks for sharing. Hi Ron! Yes, I was a little leery of using the fat-free evaporated milk but, no problem, it was fine. I would've never added nutmeg, but that works too. Enjoy the soup if you make it! Thanks and take care.